It's a Mom Thing Reviews & More! 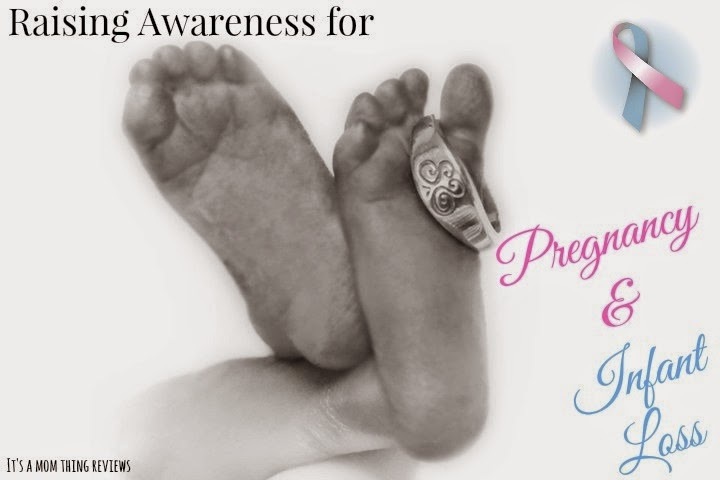 : Guest Post- Pregnancy and Infant Loss Awareness! Guest Post- Pregnancy and Infant Loss Awareness! Infant and pregnancy loss awareness is an important topic in my home. It hasn't always been this way though. Not until February 17, 2012. They day my daughter was born all too soon. It is something that I never considered happening to me or to my unborn child. It was the unthinkable. When I found out I was pregnant I was thinking about all the things I was going to do with my little one; all the things I was going to teach her. I had already started decorating her nursery and started picking out furniture. Her name had been chosen and my husband and I were so excited. It was our very first baby. But going into labor and turning septic at 23 weeks pregnant was not something I prepared for, I was young at age 21 and pretty healthy. The day I delivered my daughter silently into this world will always be the turning point in my life. My husband and I got pregnant again a year and half later. We had to undergo fertility treatment but our arms felt so empty and we knew we were ready to move on and grow our family. You wouldn't believe the shock on our faces when we found out we were having twin boys. I remember being terrified and excited all at the same time. I was scared that I would lose these little boys to. But I kept telling myself that lightning doesn't always strike twice. We were taking all the precautions to make sure that we wouldn't repeat what happened before. These things aren't always in our hands though or our doctors hands. At 18 weeks my water broke with twin A. They held on for another week before my body finally did what it is naturally told to do and I gave birth again, silently to two very little boys. I have now been diagnosed with an incompetent cervix and it's hard to believe that this diagnoses wasn't looked at before. Most woman with "IC" will have two losses before being diagnosed. And it's things like this that we need to shine more light on pregnancy loss and infant loss. It's not fair to have to bury your child and no parent should ever have to. If you have delivered pre term before or have had pre-term labor you are at higher risk of it happening again. Being pregnant with multiples increases your chances of pre-term birth. Woman with abnormalities of reproductive organs are also and increased risk of pre-term birth. It's a scary thing and it is real. I wish that I would have been more informed. If you fear that something isn't right with your pregnancy I urge you to call your doctor or visit the ER. Infant and pregnancy loss awareness to me isn't just talking about it and helping woman feel more comfortable talking about their loss, although that is important. But it is also about being so aware that we can find a way to lower the amount of deaths that happen each year to our pre-born and our infants. It is a very scary subject that needs attention.